Cookies, Crayons, Classes, & Chaos: Should I splurge on an American Girl Doll for Christmas? Should I splurge on an American Girl Doll for Christmas? Okay, well my answer is already "no." But we're homeschooling and my daughter hasn't encountered the peer pressure of American Girl dolls. And thankfully neither has her cousin / best friend, whose family also chose to get an alternative to the American Girl dolls. There is a great mom's guide to comparing American Girl doll to generic dolls. For $25-$35 you can get similar dollars to the more expensive American Girl doll. As an update to that post, note that her highly recommended xander Madame Alexander dolls are now available at Target (and Toys R Us) in addition to the My Generation Dolls. TIP: Visit Dolls Like Me for a variety of dolls from different races as well as bi-racial dolls. 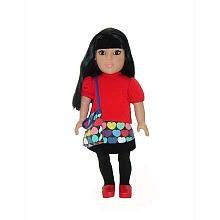 Corolle has also introduced their smaller (13") Les Chéries dolls that span a variety of ethnic backgrounds as well. I always keep an eye out for Corolle dolls at discount online retailer http://www.kidsurplus.com/. Whatever doll you choose, you may wish to take note of my "Health Care Plan for Dolls" recommendations for dealing with doll skin and hair problems! 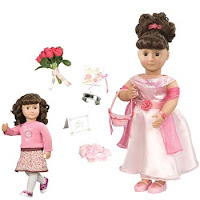 Hint...think twice about curly haired dolls, like Our Generation's Alexis or Abrianna.